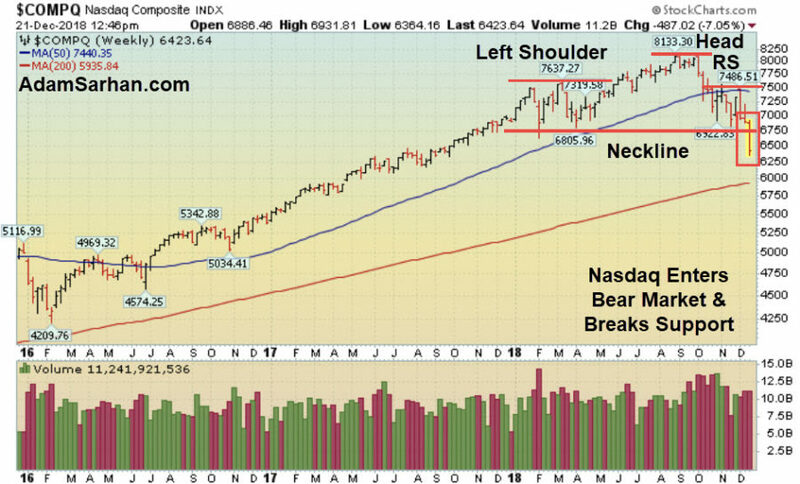 Last week was another brutal week on Wall Street as the small-cap Russell 2000 and the Nasdaq both fell into bear market territory (defined by a decline of 20% or more from a 52-week high). The Dow and S&P 500 also fell closer to that dreaded 20% level. Underneath the surface, the action is much worse as investors continue to dump stocks. The biggest takeaway for me is that the 9.5-year connection between the stock market blindly following the Federal Reserve has ended. Meaning, for the first time since the Bull Market began in March 2009, the stock market is not blindly following the Fed. That tells me that there is a lot more negative action brewing on the horizon- both on Main Street and on Wall Street. Billionaire investor, Stanley Druckenmiller, has a great line where he says, the best economist on the planet is the stock market. I couldn’t agree more and if you look under the hood, so many important areas of the market are already in bear market territory which bodes poorly for both Main Street and Wall Street. Clearly, the market is speaking, and it is my job to listen.